Heracleum maximum, cow parsnip (also known as Indian celery, Indian rhubarb or pushki) is the only member of the genus Heracleum native to North America [other species in the genus are introduced plants]. … Cow parsnip is distributed throughout most of the continental United States except the Gulf Coast and a few neighboring states. It occurs from sea level to about 9000 ft, and is especially prevalent in Alaska. It is listed as “Endangered” in Kentucky and “Special Concern” in Tennessee. In Canada, it is found in each province and territory, except Nunavut. It may be weedy or invasive in portions of its range. Note that the very same plant can be threatened in some places and rampant in others. Cow parsnip is a tall herb, reaching to heights of over 2 metres (7 ft). The genus name Heracleum (from “Hercules”) refers to the very large size of all parts of these plants. Cow Parsnip has the characteristic flower umbels of the carrot family (Apiaceae), about 20 centimetres (8 in) across; these may be flat-topped or rounded, and are always white. Thirty-some years ago I had the experience of walking within a stand of cow parsnip, towering over me, at Point Reyes, north of here in California. Two further things about cow parsnip: its classification, and its hazardous similarity to some other plants of the carrot / celery family. Its classification has caused some difficulty, with recent authoritative sources referring to it variously as Heracleum maximum or Heracleum lanatum, or as either a subspecies, H. sphondylium subsp. montanum, or a variety, H. sphondylium var. lanatum, of the common hogweed (H. sphondylium). The classification given here follows ITIS. Welcome to ITIS, the Integrated Taxonomic Information System! Here you will find authoritative taxonomic information on plants, animals, fungi, and microbes of North America and the world. We are a partnership of U.S., Canadian, and Mexican agencies; other organizations; and taxonomic specialists. Similar species, These are all Apiaceae. The water parsnip (Sium suave), western water hemlock (Cicuta douglasii), and spotted water hemlock (Cicuta maculata) all have white flowers in large compound umbels and therefore are easily confused with cow parsnip. 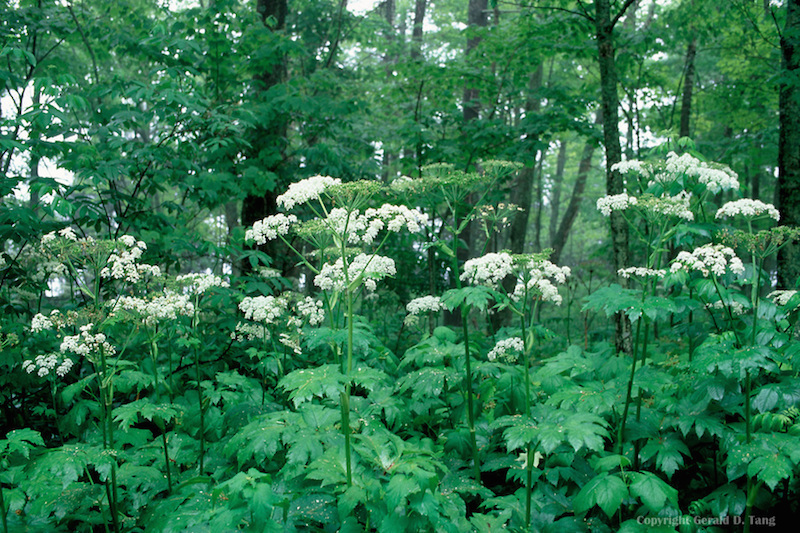 … All water hemlock is highly poisonous [like Conium maculatum, the poison hemlock of Socrates fame]. Water parsnip [like cow parsnip] is not poisonous. The Wikipedia section goes on to provide helpful pointers for distinguishing the poisonous hemlocks from the edible parsnips (note that the culinary parsnip, Pastinaca sativa, is also in the Apiaceae, though it’s a much more modest plant than the ones listed above). 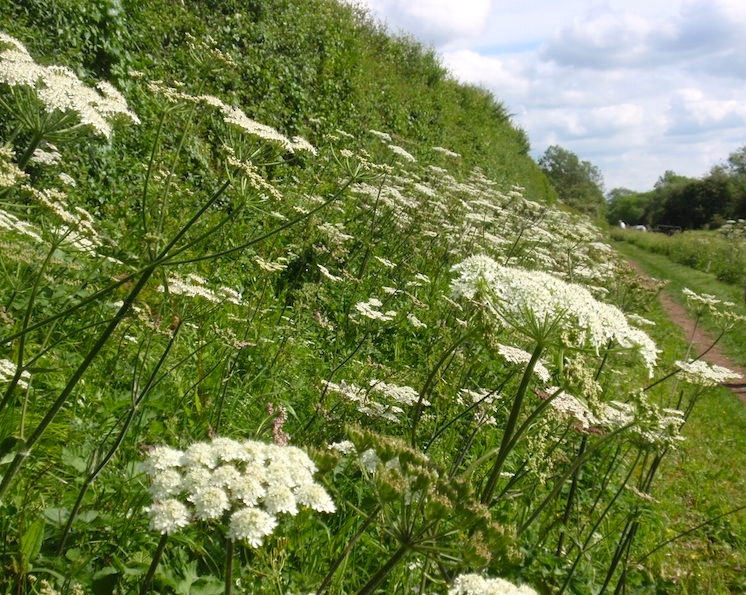 There are reports that in the U.K., cow parsley has been aggressively overwhelming other roadside plants. This entry was posted on August 30, 2015 at 5:03 am and is filed under Categorization and Labeling, Language and plants, Names. You can follow any responses to this entry through the RSS 2.0 feed. You can leave a response, or trackback from your own site.